The world of investigative reporting, and the financial muscle that sustains it, has changed. The Seattle Times has launched a fundraiser asking readers to support its investigative reporting. The nonprofit Seattle Foundation will also assist the effort, known as The Seattle Times Investigative Journalism Fund. The first milestone is to hit $500,000, which will allow the four-person investigative team (two reporters, a news researcher and deputy managing editor Ray Rivera) to hire two more investigative reporters, an editor and offset research costs, such as travel expenses. The newspaper says it has raised $85,000 to date. “Investigative reporting is the most essential journalism a news staff can do — and the most expensive,” reads the page dedicated to the effort. Seattle Times investigative reporting has uncovered the dangers of painkillers to its local community and seniors suffering abuse. In addition, it exposed double-booked surgeries at a local hospital. (That series led to a number of firings and a change in policy.) It also expedited FDA changes to help prevent birth defects, according to the newspaper. 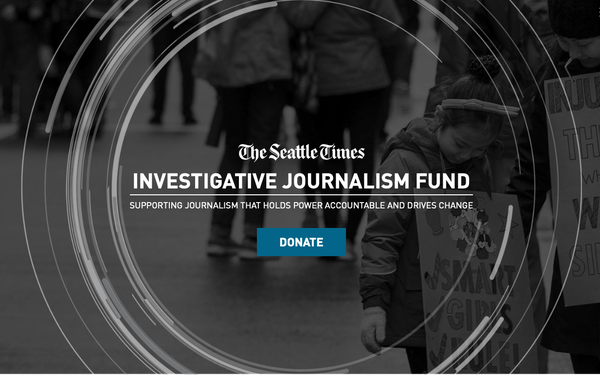 The Seattle Times Investigative Journalism Fund and the Seattle Foundation specifically want to tap into “community funders and personal champions of the free press" to support its investigative efforts, according to the website. In the last eight years, The SeattleTimes raised $4 million from 21 foundations, corporations and nonprofits to cover education, traffic and homelessness, according to Poynter. The initiative is similar to what The Guardian has achieved with readers' support. Guardian US has crowdfunded a number of editorial series, such as the challenges of motherhood in America, the growing threat to the country’s public lands, and exploring solutions to the gun-violence crisis. The Guardianannounced last year it now receives more revenue from readers than from advertisers, with over 500,000 readers globally who support the publisher monthly — either through a contribution or subscription. However, unlike The Guardian, The Seattle Times is not asking readers to participate in specific editorial initiatives. A disclaimer on its Investigative Journalism Fund site reads: “Funders do not have any input into the reporting of stories or into any of the specific content that will be produced with fund resources. Funders are not aware of specific stories The Seattle Times newsroom is working on and do not review them before publication."